(Nanowerk Spotlight) The huge economic impact of the corrosion of metallic structures is a very important issue for all modern societies. Estimates for the cost of corrosion degradation run to about €200 billion a year in Europe and over $270 billion a year in the U.S. The annual cost of corrosion consists of both direct costs and indirect costs. Worldwide, it is estimated that these costs approach $1 trillion annually. The direct costs are related to the costs of design, manufacturing, and construction in order to provide corrosion protection, and the indirect costs are concerned with corrosion-related inspection, maintenance and repairs. Given the huge economic incentives, corrosion prevention and protection is a major business. The advanced materials that are being developed and used in modern industries require increasingly sophisticated coatings for improved performance and durability. Take for example the case of microbially induced corrosion (MIC) – one of the lesser understood forms of corrosion where micro-organisms manifest metallic surfaces and induce substantial damage that often goes unnoticed until there is a loss in the component functionality. "The most significant finding of our work is that graphene coating offers 100-fold improvement in corrosion resistance compared to commercial polymer coatings available in the market," Dr. Ajay Krishnamurthy, currently a Guest Researcher at the Engineering lab (EL) at National Institute of Standards and Technology (NIST), and the paper's first co-author, tells Nanowerk. "This finding is remarkable considering that graphene is nearly 4000 times thinner than several commercial coatings but offers more than an order of magnitude higher resistance to microbial attack." Ultra-thin graphene coatings have already been demonstrated as corrosion-resistant coatings for metals. However, as Krishnamurthy notes, two recent studies have provided some very interesting observations on the failure of graphene coatings on copper substrates. "CVD graphene coatings have come under a lot of scrutiny recently. This is because the CVD process of producing graphene often introduces surface defects such as dangling bonds, stone wales defects, point defects etc. Coupled with its superior electrical conductivity, these sites act as means of charge transport and lead to localized (pitting) corrosion of the metallic surfaces over long periods of time." With the current study, the international research team, which included scientists from Rensselaer Polytechnic Institute, South Dakota School of Mines and Technology, Oklahoma State University, and Shenyang National Lab for Materials Science, hypothesized that the defective sites on the graphene sheet are clogged due to the presence of polysaccharides and other microbial debris which lead to overall reduction in metallic corrosion rates over extended periods of time. In a publication two years ago ("Passivation of microbial corrosion using a graphene coating"), the team had compared a bare nickel surface to a few-layer CVD graphene coated nickel surface and showed lower charge transfer and lower Ni ion dissolution due to the presence of graphene coating. In their current publication, they have taken this study one step further and tried to understand how the microbial communities that colonize the protection system can affect the corrosion rates. "Furthermore, we have used the graphene coating as a benchmark to compare to other popular polymer coatings such as Parylene and Polyurethane," Dr. Krishnamurthy points out. "Though initially promising, these coatings failed due to various reasons including microbial attack – fermentation, acid production etc. – and the non-conformity of hand-applied coatings." 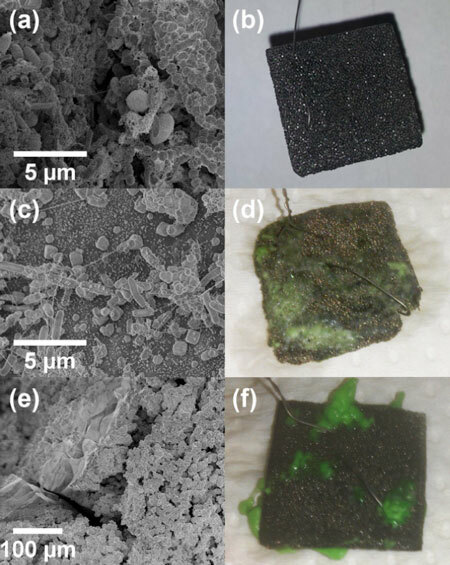 Despite complete surface colonization by microbes (figures a, c and e above), figures b, d and f illustrate that the graphene coated Ni maintains its integrity without noticeable surface corrosion (fig. b), while the parylene (fig. d) and polyurethane (fig. f) coated surfaces both rapidly corroded with visible (green and gooey) by-products on the surface. "Having established that CVD-grown few-layer graphene offers superior resistance to MIC, we sought to characterize the defectiveness of the as-grown graphene coating when compared to graphene films that are transferred (wet-transfer) onto surfaces that are incompatible with CVD growth," says Dr. Krishnamurthy. For this purpose, to cater to practical applications of using graphene coatings on surfaces where it can't be CVD grown, the researchers transferred 1-3 layers of graphene onto SiO2 surfaces and examined the effects of the transfer process on introducing surface defects in the graphene sheets. "We mapped the defect peak intensity (ID/IG) ratios using confocal raman spectroscopy," Dr. Krishnamurthy describes the investigation. "We concluded that the wet etch chemical methods introduce significant amount of defects, while the CVD growth process in itself is less deterrent." This work shows that microbial conditions provide a unique dimension to corrosion research. The microbes are capable of forming insulating polysaccharide films on the graphene surface that can further mitigate metallic corrosion. The scientists hypothesize that the graphene/microbe interaction is providing a unique benefit to corrosion applications. The next stages of the team's investigations are to test these coatings for other technologically relevant metals including mild steel. "Our past research work evaluated graphene coatings for porous metallic electrodes under immersed conditions," concludes Dr. Venkata Gadhamshetty, an Associate Professor at South Dakota School of Mines & Technology, who is continuing this work on MIC in collaboration with Professor Nikhil Koratkar at Rensselaer Polytechnic Institute. "We will evaluate graphene coatings for flat metal sheets typical to the construction industry, and also aggressive atmospheric conditions including C5-I category as defined by ISO."